As the second installment of our three-part series on links, this TUNE Guide builds on the core concepts introduced in The TUNE Guide to Links. In the first guide, we laid the foundations of link-based marketing: the role of links in the digital ecosystem; how links work, and the different forms they can take; and key challenges to be aware of when using links, both with and without a measurement partner such as TUNE. In this second guide, we’ll take a deeper look into linking for cross-channel attribution and compare the solutions available to marketers today. Attribution is the process of associating an outcome, such as an online purchase or app download, with a preceding activity, such as clicking on an email or a display ad. In digital advertising, marketers use attribution to compensate advertising partners for the outcomes they influence. Marketers also use attribution to tie their earned and owned marketing efforts to definitive results. Cross-channel attribution uses a combination of advanced tracking, linking, and analytics to measure the influence and value of every touchpoint across all channels of the customer journey. With the evolution of the smartphone and the rise of activities spanning multiple devices, the modern customer journey extends across more screens, platforms, and channels than ever before. Users can begin a journey on one device and finish it on another, interacting with multiple touchpoints along the way. Currently, cross-channel attribution is the only way marketers can measure the entire customer journey and evaluate the ROI of their marketing efforts across every channel and device. It’s also the only way to see both the combined impact of all channels and channel synergies — how combinations of various channels work toward a conversion goal. This holistic measurement approach provides insights into how different marketing activities influence customers across devices and channels, which helps to determine the true value of each marketing effort. For a deep dive into marketing channel synergies and strategies, check out our Better Together: The Elements of Paid & Organic Marketing e-book. Cross-channel attribution provides an end-to-end account of marketing performance. To unlock deep insights into ROI and customer behavior, digital marketers need unified analytics. Unified analytics enable marketers to determine the value of each of their marketing activities by turning measurement data into customer insights. By collecting and analyzing all data across paid and non-paid channels, a unified analytics solution can inform the touchpoints most valuable to a company’s goals and identify which channels are most important for a certain journey or outcome. Digital marketers study these insights and use them to optimize their link-based marketing efforts accordingly. Cross-channel attribution and unified analytics can only be unlocked with intelligent linking that routes every user to the proper destination without measurement leakage. Without the optimal routing, new and returning customers end up in the wrong place, sometimes with errors, and marketers suffer from inaccurate insights and fragmented data. Because mobile attribution is relatively new, it’s often viewed as as an add-on to traditional desktop web measurement, rather than an integral part of a modern marketing measurement solution. The same is true for mobile linking platforms. This has led to the rise of companies specializing in one or the other, but not both. Lacking an integrated solution, digital marketers to date have been forced to implement and use multiple products to obtain the cross-channel attribution, linking, and analytics capabilities they need. We’ve been using links to track ads and route users across the digital ecosystem since TUNE was founded in 2009. That’s why we’ve always built best-in-class linking and attribution directly into our performance marketing solutions. No other company today offers a similar level of performance and expertise in integrated linking and measurement across mobile and desktop. With a single TUNE Link, marketers can send every user to the right destination with an experience tailored to their platform and device. What sets a TUNE Link apart from every other legacy tracking link is its versatility. One TUNE Link can measure and manage any digital user path, including web-to-web, mobile web-to-mobile web, app-to-app, app-to-mobile web, and mobile web-to-app, with full support for deep links, deferred deep links, Universal Links, and App Links. While useful in any campaign, this capability is especially beneficial to marketers whose campaigns span mobile and desktop and include multiple possible destinations. (An email campaign, for example, can be opened on a desktop email client, in a mobile app, via a website on mobile web or desktop web, and so on.) In these situations, a marketer may want an ad to take desktop users to a website and mobile users to in-app content, or if the relevant app is not installed to the app store or to a URL on mobile web, or to an interstitial experience that lets each mobile user decide where to go. A single TUNE Link lets the marketer tailor the campaign to different target audiences, allowing for conversion optimization and optimal user experiences, without wasting time and resources to create separate segments and links for each audience. TUNE Links also include a feature called the bridge page, as outlined in the graphic above. A bridge page is a customizable interstitial experience for mobile that allows each user to select which final destination is right for them. Bridge pages help to ensure the right routing and destinations when outside forces interfere with normal routing behavior. 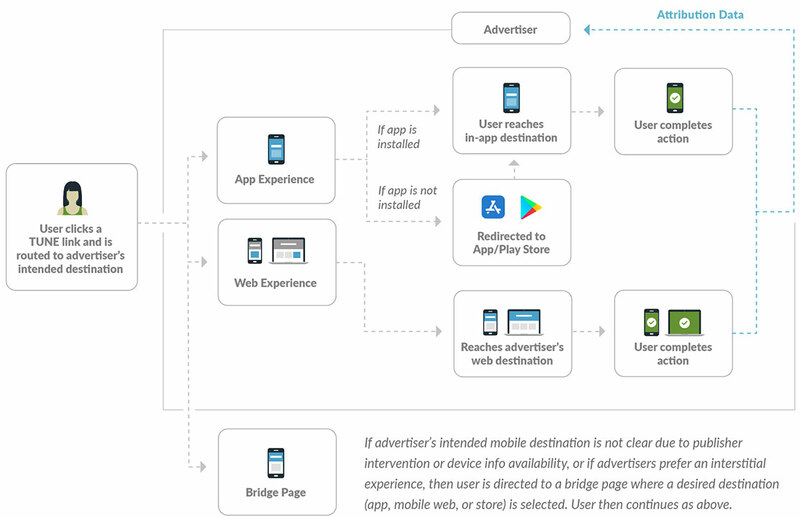 For example, a bridge page keeps mobile deep links intact, allowing a user to access in-app content even when the marketer’s Universal Link or App Link fails (wrapping and shortening breaks these links, and publishers often wrap links for tracking purposes). In addition to acting as a safety net, a bridge page can act as a content preview or brand landing page, which can help marketers reduce drop-off risks and build user trust in critical interstitial moments by offering users contextual, relevant content presented in an official, branded experience.. Tip: Find use cases and best practices for bridge pages in our upcoming third guide, The TUNE Guide to Linking Best Practices. 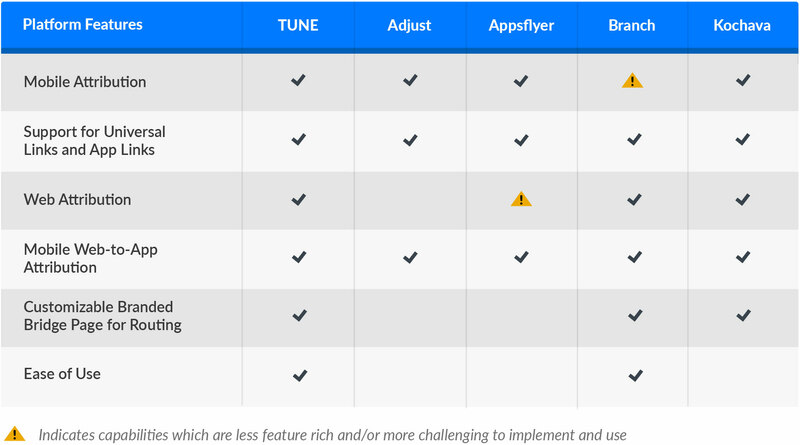 For marketers looking for best-in-class cross-channel attribution and flexible, customizable routing in one easy-to-use solution, TUNE has the competition beat. One important thing to keep in mind: Implementing a cross-channel measurement solution is a technical process that requires working closely with a measurement partner. In addition to a solution’s functionality, featured integrations, and system reliability, marketers should consider the track record of customer service and technical support options for every potential partner they evaluate, as these two areas play an oversized role in the long-term success of the implementation. TUNE delivers an all-in-one solution for cross-channel linking, attribution, and analytics in our Attribution Analytics product. Because TUNE measures across mobile and desktop, handles all partner relationships and attribution, has analytics built in, and provides one link for every campaign and situation, marketers can leave the hard part to us and focus their energy instead on making the connections that matter. In the third and final part of our series on linking, The TUNE Guide to Linking Best Practices, we’ll lay out the best practices for linking and demonstrate how marketers can use TUNE Links to increase user retention and engagement, boost conversions and revenue, and optimize the customer journey in campaigns across web, mobile web, and app. TUNE Links will be fully available to all TUNE customers at no additional cost in August 2018. Visit tune.com/get-started to learn more.